Arkansas Headwaters - In A Colorado Minute (Week 204) from Luci Westphal on Vimeo. The Arkansas River actually begins its journey in Colorado, where its waters are derived from the Rocky Mountains snowpack. 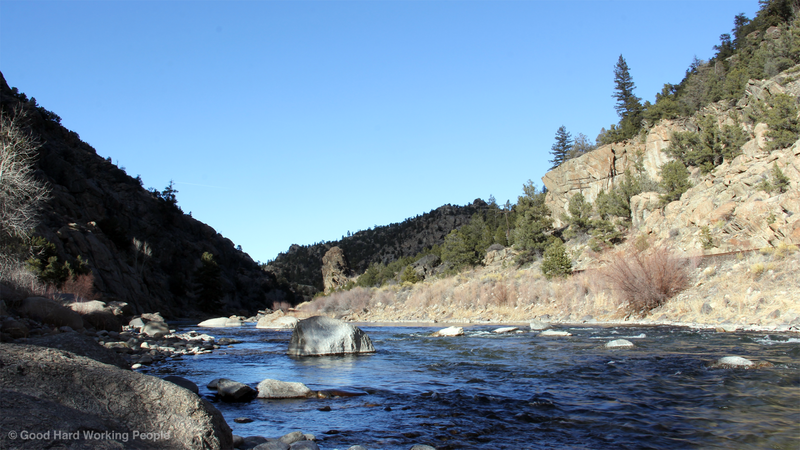 A good section around the early part, or headwaters, of the Arkansas River have been designated as a Colorado State Park called Arkansas Headwaters State Park. Conveniently, because I purchased a year-pass for Lory State Park near Fort Collins, we're able to get in for free at all 42 Colorado State Parks. So on our drive back from a road trip during Week 200, we stopped at a section of the river that is one of the most popular river boating (whitewater rafting, etc.) areas in the United States - and great for trout fishing, as well. I really didn't expect it to be that beautiful. Nor did I plan on shooting a weekly video about this place, so I didn't even take the tripod out of the car - hence some shaky footage and a few still photos, with which I replaced the same images as video at the very last minute before uploading. We were so taken by how gorgeous this area was that we spent most of the afternoon hiking around and then basking in the sun on the top of a small peak just looking around at the wonderful vista. A classic Happy Place. Also, I want to figure out which train line runs along the river here. I suspect it's the Royal Gorge Route - but it might just be regular Amtrak line - if it's even a track for people transportation. One of my top priorities this spring/summer is to get on one of the Rocky Mountains trains and share a video of that trip with you! The lovely song in this video is the instrumental version of "Chainsaw" by Josh Woodward, who makes hundreds of his songs available through a Creative Commons license. How awesome is that?